We believe the most successful outcomes are the result of an ongoing collaborative relationship. The more information our clients provide, the better the finished project reflects individual personalities and lifestyles. Photos, rough sketches, and insights into how space will be used are all helpful ways to begin a discussion. Below is a brief explanation of what to expect during the entire process. Determine through discussion the full extent of your needs for space and the functions within these spaces. What activities should be close together or far apart? What are the characteristics of your favorite places? Do you have ideas or a vision for these spaces? Prepare a detailed description of your space requirements and the nature of each space. We analyze the site to uncover any potential constraints or assets, whether due to zoning, topography or other conditions. Develop design options for your input using drawings with sections, plans, and elevations, or models, and preliminary construction costs. Refine the exterior materials, dimensions, and spatial relationships along with interior materials and initial concepts for built-ins and trim work. Estimate construction costs by preparation of the working drawings and specifications for the project, including coordination with consultants such as structural engineers. We obtain bids and guide you through the bid selection and contract negotiation process. Conduct site visits to document construction progress, prepare site reports to keep you up to date, process requests for payments from the contractor, and monitor punch list completion to close out a project. Range from consultations to property master plans including construction documents. Provide site construction including: grading, drainage, and rainwater conservation systems. We install paving, stonewalls, pools. outbuildings, and fencing. 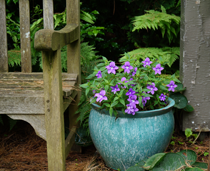 Supply plants for your landscape from selective nurseries and ensure that soils are properly prepared and beds finished. We coordinate with irrigation contractors to ensure adequate moisture while plants are establishing in the landscape. Provide fine gardening services including: hand pruning of ornamental trees and shrubs, planting of perennials and bedding annuals, seasonal containers and general maintenance of borders and ornamental plantings. 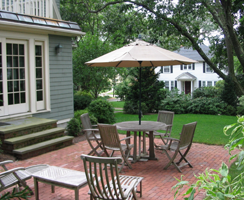 Refine and refurbish portions of existing landscapes: overgrown foundation plantings, installation of evergreens for privacy, and a new patio are examples of this kind of work.